Contractors, approvers and clients all receive unique logins, with our online portal available 24/7. 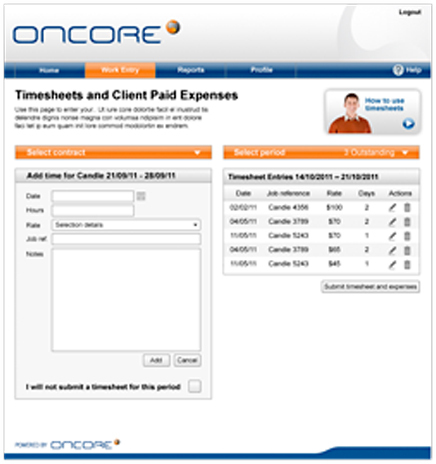 This guarantees easy access to all your essential contracting information, including approval and reporting as well as timesheets and expense processing. All reporting, including salary slips, revenue reports, expenses and timesheets, is also available through the portal, as well as agency margin reporting, overdue and un-approved timesheets, drawdown reports and invoice data extracts. This rich data capture allows you to effectively manage your contractors on a day to day basis, giving you the knowledge to improve efficiencies across your agency and stay on top of your contracting engagements. Oncore has invested heavily in developing leading edge contractor management software – and now we’re sharing it with you. This means our contractor payroll solutions are all designed to work transparently behind your agency, giving you the option to brand our software with your label. This means your clients and contractors stay connected to your brand while our solutions build your brand, not ours. All documentation carries your brand, including invoices and account collections. We currently provide these white label services to a number of leading recruitment agencies and have a proven track record when it comes to delivering financial success through technology.